A wiki is a website that allows the visitors themselves to easily add, remove, and otherwise edit and change available content, and typically without the need for registration. This ease of interaction and operation makes a wiki an effective tool for mass collaborative authoring. The term wiki also can refer to the collaborative software itself (wiki engine) that facilitates the operation of such a Web site, or to certain specific wiki sites, including the computer science site (the original wiki) WikiWikiWeb and on-line encyclopedias such as Wikipedia. On May 25, 2018, the transitional period of the new EU-DSGVO and the BDSG expires and thus they become binding and must also be used in this wiki. Today we upgraded PHP on our servers to version PHP7. Please inform Webmin if you find an error. MediaWiki-software upgrade to the current version 1.28.1. Please inform Webmin if you find an error. MediaWiki-software update to the current version. Please inform Webmin if you find an error. MediaWiki-software upgrade to the current version 1.27.0. Please inform Webmin if you find an error. MediaWiki-software upgrade to the current version 1.26.0. Please inform Webmin if you find an error. MediaWiki-software upgrade to the current version 1.25.1. Please inform Webmin if you find an error. There are 570 total pages in the database. This includes "talk" pages, pages about CANopen-Lift, minimal "stub" pages, redirects, and others that probably do not qualify as content pages. Excluding those, there are 179 pages that are probably legitimate content pages. 299 files have been uploaded. There have been a total of 561,022 page views, and 4,406 page edits since CANopen-Lift was setup. That comes to 7.73 average edits per page, and 127.33 views per edit. There are 146 registered users, of which 3 have Sysops rights. MediaWiki-software update to the current version 1.24.1. Please inform Webmin if you find an error. MediaWiki-software upgrade to the current version 1.24. Please inform Webmin if you find an error. MediaWiki-software update to the current version 1.23.6. Please inform Webmin if you find an error. MediaWiki-software update to the current version 1.23.5. Please inform Webmin if you find an error. MediaWiki-software update to the current version 1.23.4. Please inform Webmin if you find an error. MediaWiki-software update to the current version 1.23.3. Please inform Webmin if you find an error. MediaWiki-software update to the current version 1.23.2. Please inform Webmin if you find an error. There are 515 total pages in the database. This includes "talk" pages, pages about CANopen-Lift, minimal "stub" pages, redirects, and others that probably do not qualify as content pages. Excluding those, there are 154 pages that are probably legitimate content pages. 271 files have been uploaded. There have been a total of 450,158 page views, and 4,234 page edits since CANopen-Lift was setup. That comes to 8.22 average edits per page, and 106.32 views per edit. There are 145 registered users, of which 3 have Adminitrator rights. MediaWiki-software update to the current version 1.23.1. Please inform Webmin if you find an error. MediaWiki-software upgrade to the current version 1.23. Please inform Webmin if you find an error. MediaWiki-software update to the current version 1.22.6. Please inform Webmin if you find an error. MediaWiki-software update to the current version 1.22.5. Please inform Webmin if you find an error. MediaWiki-software update to the current version 1.22.4. Please inform Webmin if you find an error. MediaWiki-software update to the current version 1.22.3. Please inform Webmin if you find an error. There are 463 total pages in the database. This includes "talk" pages, pages about CANopen-Lift, minimal "stub" pages, redirects, and others that probably do not qualify as content pages. Excluding those, there are 154 pages that are probably legitimate content pages. 241 files have been uploaded. There have been a total of 374,948 page views, and 4,004 page edits since CANopen-Lift was setup. That comes to 8.65 average edits per page, and 93.64 views per edit. There are 144 registered users, of which 3 have Sysops rights. MediaWiki-software update to the current version 1.22.2. Please inform Webmin if you find an error. Time is flying and the look and feel of CANopen-Lift.org was outdated. So we spent a lot of time in the last weeks to give the wiki a new fresh design. Some articles we still have to renew. We'll do it in the next weeks. We hope you like it. There are 323 total pages in the database. This includes "talk" pages, pages about CANopen-Lift, minimal "stub" pages, redirects, and others that probably do not qualify as content pages. Excluding those, there are 125 pages that are probably legitimate content pages. 148 files have been uploaded. There have been a total of 315,721 page views, and 3,340 page edits since CANopen-Lift was setup. That comes to 10.34 average edits per page, and 94.53 views per edit. There are 134 registered users, of which 3 have Sysops rights. MediaWiki-software update to the current version 1.21.1. Please inform Webmin if you find an error. MediaWiki-software update to the current version 1.20.6. Please inform Webmin if you find an error. MediaWiki-software upgrade to the current version 1.20.5. Please inform Webmin if you find an error. Today we moved the wiki to a new webserver to have more resources again the spam attacks. MediaWiki-software update to the current version 1.19.6. Please inform Webmin if you find an error. MediaWiki-software update to the current version 1.19.5. Please inform Webmin if you find an error. MediaWiki-software update to the current version 1.19.4. Please inform Webmin if you find an error. MediaWiki-software update to the current version 1.19.3. Please inform Webmin if you find an error. MediaWiki-software update to the current version 1.19.2. Please inform Webmin if you find an error. MediaWiki-software upgrade to the current version 1.19.1. Please inform Webmin if you find an error. There are 302 total pages in the database. This includes "talk" pages, pages about CANopen-Lift, minimal "stub" pages, redirects, and others that probably do not qualify as content pages. Excluding those, there are 123 pages that are probably legitimate content pages. 145 files have been uploaded. There have been a total of 224,875 page views, and 3,250 page edits since CANopen-Lift was setup. That comes to 10.76 average edits per page, and 69.19 views per edit. There are 97 registered users, of which 4 have Sysops rights. MediaWiki-software upgrade to the current version 1.18.2. Please inform Webmin if you find an error. Since 2 weeks spammer attack this wiki very massive. Today we decided to switch of the possibility of a free registration for new users for a view weeks. There are 291 total pages in the database. This includes "talk" pages, pages about CANopen-Lift, minimal "stub" pages, redirects, and others that probably do not qualify as content pages. Excluding those, there are 119 pages that are probably legitimate content pages. 138 files have been uploaded. There have been a total of 184,480 page views, and 2,690 page edits since CANopen-Lift was setup. That comes to 9.24 average edits per page, and 68.85 views per edit. There are 89 registered users, of which 3 have Sysops rights. MediaWiki-software upgrade to the current version 1.17.0. Please inform Webmin if you find an error. There are 278 total pages in the database. This includes "talk" pages, pages about CANopen-Lift, minimal "stub" pages, redirects, and others that probably do not qualify as content pages. Excluding those, there are 114 pages that are probably legitimate content pages. 130 files have been uploaded. There have been a total of 151,951 page views, and 2,631 page edits since CANopen-Lift was setup. That comes to 9.46 average edits per page, and 57.75 views per edit. There are 94 registered users, of which 3 have Sysops rights. Security update of the MediaWiki-software to the current version 1.16.5. Please inform Webmin if you find an error. Security update of the MediaWiki-software to the current version 1.16.4. Please inform Webmin if you find an error. Security update of the MediaWiki-software to the current version 1.16.3. Please inform Webmin if you find an error. Security update of the MediaWiki-software to the current version 1.16.2. Please inform Webmin if you find an error. Security update of the MediaWiki-software to the current version 1.16.1. Please inform Webmin if you find an error. There are 270 total pages in the database. This includes "talk" pages, pages about CANopen-Lift, minimal "stub" pages, redirects, and others that probably do not qualify as content pages. Excluding those, there are 110 pages that are probably legitimate content pages. 128 files have been uploaded. There have been a total of 116,500 page views, and 2,595 page edits since CANopen-Lift was setup. That comes to 9.61 average edits per page, and 44.89 views per edit. There are 87 registered users, of which 3 have Sysops rights. MediaWiki-software upgrade to the current version 1.16.0. Please inform Webmin if you find an error. There are 255 total pages in the database. This includes "talk" pages, pages about CANopen-Lift, minimal "stub" pages, redirects, and others that probably do not qualify as content pages. Excluding those, there are 104 pages that are probably legitimate content pages. 121 files have been uploaded. There have been a total of 99,004 page views, and 2,550 page edits since CANopen-Lift was setup. That comes to 10.00 average edits per page, and 38.83 views per edit. There are 83 registered users, of which 3 have Sysops rights. Security update of the MediaWiki-software to the current version 1.15.4. Please inform Webmin if you find an error. Security update of the MediaWiki-software to the current version 1.15.3. Please inform Webmin if you find an error. Security update of the MediaWiki-software to the current version 1.15.2. Please inform Webmin if you find an error. MediaWiki-software update to the current version 1.15.1. Please inform Webmin if you find an error. There are 239 total pages in the database. This includes "talk" pages, pages about CANopen-Lift, minimal "stub" pages, redirects, and others that probably do not qualify as content pages. Excluding those, there are 93 pages that are probably legitimate content pages. 112 files have been uploaded. There have been a total of 61,181 page views, and 2,441 page edits since CANopen-Lift was setup. That comes to 10.21 average edits per page, and 25.06 views per edit. There are 70 registered users, of which 3 have Sysops rights. MediaWiki-software upgrade to the current version 1.15.0. Please inform Webmin if you find an error. At this weekend we made a webserver update to Fedora 10. With this update we also fixed a problem with the upload of svg-files. MediaWiki-software update to the current version 1.14.0. Please inform Webmin if you find an error. MediaWiki-software update to the current version 1.13.4. Please inform Webmin if you find an error. Today, we fixed a problem with a memory overflow at the webserver. Please test the wiki and give us a feadback, if there are any problems. There are 237 total pages in the database. This includes "talk" pages, pages about CANopen-Lift, minimal "stub" pages, redirects, and others that probably do not qualify as content pages. Excluding those, there are 92 pages that are probably legitimate content pages. 111 files have been uploaded. There have been a total of 45,634 page views, and 2,397 page edits since CANopen-Lift was setup. That comes to 10.11 average edits per page, and 19.04 views per edit. There are 47 registered users, of which 3 (or 6.38%) have Sysops rights. MediaWiki-software update to the current version 1.13.3. Please inform Webmin if you find an error. MediaWiki-software update to the current version 1.13.1. Please inform Webmin if you find an error. MediaWiki-software update to the current version 1.13.0. Please inform Webmin if you find an error. This should be enough power for the next few month. If you find a technical problem, please don't hesitate to contact the Webmin. MediaWiki-software update to the current version 1.12.0. Please inform Webmin if you find an error. MediaWiki-software update to the current version 1.11.1. Please contact the Webmin if you find an error. Today we installed the extension SpecialInterwiki at this wiki. So you can find now all the interwiki links at Special:Interwiki. There are 185 total pages in the database. This includes "talk" pages, pages about CANopen-Lift, minimal "stub" pages, redirects, and others that probably don't qualify as content pages. Excluding those, there are 87 pages that are probably legitimate content pages. 73 files have been uploaded. There have been a total of 17,048 page views, and 2,086 page edits since CANopen-Lift was setup. That comes to 11.28 average edits per page, and 8.17 views per edit. There are 32 registered users, of which 3 (or 9.38%) have Sysops rights. MediaWiki-software update to the current version 1.11.0. Please contact the Webmin if you find an error. MediaWiki-software update to the current version 1.10.1. Please contact the Webmin if you find an error. After an update PHP-version 5.2.3 last week, it wasn't possible to upload pictures. This problem is fixed now. Today I added the favicon for this website. Now, there should be displayed the little CANopen-Lift icon in the URL-bar of your browser. There are 1,643 total pages in the database. This includes "talk" pages, pages about CANopen-Lift, minimal "stub" pages, redirects, and others that probably don't qualify as content pages. Excluding those, there are 62 pages that are probably legitimate content pages. 60 files have been uploaded. There have been a total of 5,896 page views, and 417 page edits since CANopen-Lift was setup. That comes to 0.25 average edits per page, and 14.14 views per edit. The job queue length is 1. There are 21 registered users, of which 3 (or 14.29%) have Sysops rights. MediaWiki-software update to the current version 1.10.0. Please contact the Webmin if you find an error. There was a problem with special characters in the URL. It is fixed now and you can access the pages again. Please contact the Webmin if you find another error. Now the migration to the new server is finished and the final URL is ready to use. 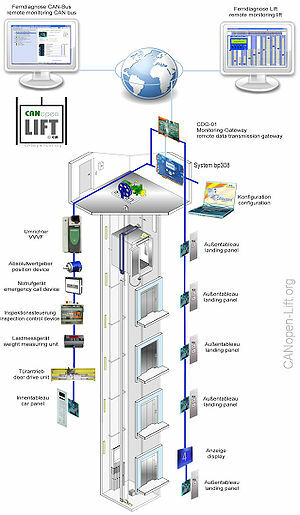 The English part of the wiki you can find at the URL http://en.canopen-lift.org and the German part at http://de.canopen-lift.org. Please contact the Webmin if you find an error. To patch some security problems we made an update of the MediaWiki-software to the current version 1.9.3. Please contact the Webmin if you find an error. To patch some security problems we made an update of the MediaWiki-software to the current version 1.9.2. Please contact the Webmin if you find an error. Update the MediaWiki-software to the current version 1.9.1. Please contact the Webmin if you find an error. MediaWiki-software update to the current version 1.9.0. Please contact the Webmin if you find an error. This page was last edited on 9 March 2018, at 17:50.